Whenever I pass an old farmhouse on a country road, I usually start to wonder about the story behind it. How many generations lived there? They must have been so proud to build a new home. I ponder what it might be like on the inside. I usually feel a bit sad for the years long past and stories forgotten. 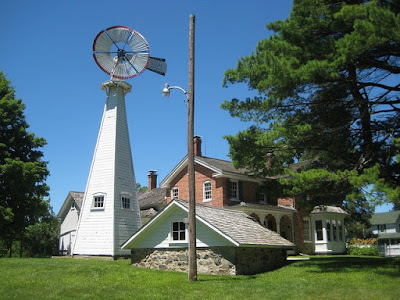 Visiting a place like the Waterloo Farm Museum, between Stockbridge and Chelsea, Michigan, is like looking through a window into the past, an opportunity to soak up the ambience of a weathered farmhouse. The farm museum is called a "Memorial to the Michigan Pioneer Farmer." Michigan territory had long been thought of as uninhabitable swampland, but some took their chances where the territory became a state which boasted "If you seek a pleasant peninsula, look about you," for a motto. through marshy lands. They were able to purchase eighty acres and a simple log cabin in 1844. Ten years later, a sitting room was added. This became the first room of the current farmhouse after the log cabin was torn down in the 1880s and the L frame was built. The little boy called Jacob grew into a man and enlisted with the Union Army. He signed his name in the Americanized form, Jacob Realy. When he returned, he married the neighbor's daughter, Catherine. He opened a cider mill across the road and began his family. The Realy's farm grew and prospered, marked by their generous sized pantry with lovely cupboards. It saw many a loaf of bread kneaded and coffee beans ground, as well as other baked goods prepared for the family there. Dishes were done in a granite tub and put away into unique pass-through drawers, which could be accessed on the other side in the dining room when it was time to set the table. Such an innovation showed off their prosperity, not to mention the fine dishes and silver in their possession. four sons lived on the farm until they were quite elderly. Their sister, Sophia, looked after them. The father, Jacob, was disabled by a wound during the Civil War and was unable to do heavy labor. He lived on the farm until his death in 1916. His wife, Catherine, died in 1919. A member of the Realy family inhabited the farm until 1960, when Albert, the last of the third generation of Realys to live there, passed away. Sometime before that the brothers had sold their property to the state of Michigan to be included as part of the Waterloo Recreation Area. The state tore down the cider mill and the barn, but an appeal was made to the local citizens for the preservation of the farmhouse. The Waterloo Historical Society was formed in 1962 with the interest in passing on history to the next generation. The farmhouse was lovingly restored by volunteers and many family heirlooms were given by those who wanted to remember their ancestors in a tangible way. Over the years, the icehouse, windmill, and springhouse were restored. A log cabin was erected in 1976, to replace the original, reconstructed from a log cabin taken apart and brought from the nearby town of Stockbridge. A workshop and granary were added from nearby farms. To complete the historical experience, a few miles down the road from the farmhouse still stands a one-room schoolhouse, called the Dewey School. 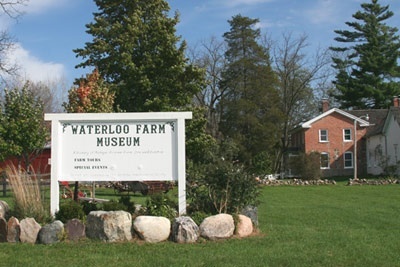 The Waterloo Area Farm and Dewey School Museums are both open on summer weekends and for special events. They provide a special look into the pioneer farming days, while preserving history. Find out more about these places at: http://www.waterloofarmmuseum.org/ and their Facebook page. Kathleen Rouser was so enthralled with books, she wanted to write stories before she could read them. A past homeschooling mom and mild-mannered dental assistant, Kathleen writes from her home in Michigan, where she lives with her husband of 34 years, who not only listens to her stories, but also cooks for her. And let’s not forget her resident muse is a sassy tail-less cat named Lilybits. Her debut novel, Rumors and Promises, from Lighthouse Publishing of the Carolinas, is coming out in April, 2016. Connect with Kathleen at her website, Facebook author page, Twitter and Pinterest. Kathleen, this is a delightful post. I, too, pass old homesteads here in southwest Colorado and wonder about their stories. It's rumored that a school was on our east cattle pasture. No signs of it now, but I've been given the name of an old-timer who is supposed to know all about it. Thank you for your post. that we sometimes forget is literally in our backyards! That's such a cool farmhouse. I'd love to visit it if it wasn't so far away. Don't you wish walls could talk? the late 1800s. It is a very cool place to visit. Fun! I would love to visit old farm homesteads. That would be amazing! Thanks for a great post. You're welcome. I'm glad you enjoyed the post. Glad you enjoyed the post, Sharon. Thanks for stopping by and leaving a comment.